Lancardo is a young trendy fashion watch band start at 2015, we specialized in design, development and produce all kinds of watches and watch accessories. we have excellent designers , experienced factory, passionate sales & customer service team. Our goal is that everyone can enjoy our beautiful fashion watches, and your satisfaction is our NO.1 principle. High quality quartz movement with big Arabic numerals markers and 7 color flash digital dial - easy to tell time even in darkness. Adjustable Rubber strip with metal buckle closure, which is durable and also comfortable, no harm to kids skin and cloth,suit for boy or girl between 3-10 years old. The extra button on the right are Chronograph buttons, you can usd as a stop watch. 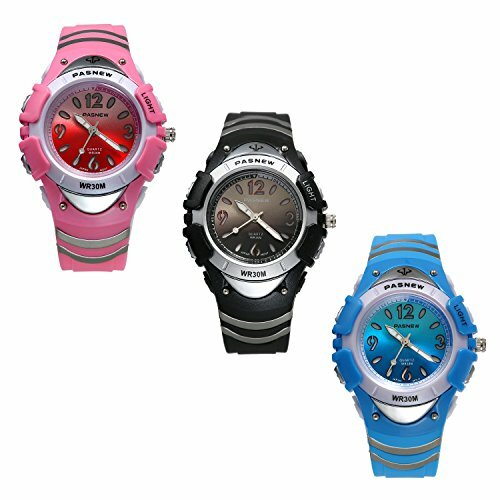 Shock resistant,climbing running with a stopwatch and friends and family sports, it's a good choice for Parent-child interaction. Water resistant to 30 m (99 ft), meet daily Use. Splash/rain resistant. Not suitable for showering, bathing, swimming, snorkelling, water related work and fishing. Not suitable for diving, do NOT press any key underwater. Package: 100% brand new watch, come with a black velvet gift box printed Lancardo, no need extra packing, a great gift for your loved ones. If you have any questions about this product by Lancardo, contact us by completing and submitting the form below. If you are looking for a specif part number, please include it with your message.